Mono is my best friend! It’s taught and is teaching me a lot about the deficiencies in my recordings and mixes. If it’s smacking at low volume, whisper say, in mono when it goes to stereo and the volume comes up it the mix just becomes even more exciting. I haven’t nailed it yet but it’s just brilliant for highlighting masking and phase stuff in your work. This is in some ways a modernization of the arguments that Phil Spector was pushing in the late 60s – that stereo sound takes a lot of control away from the producer and puts it in the hands of the listener or the environment they’re in. What, then, do you have to say about multichannel/surround mixes? You could make a reasonable case to say that the same arguments apply even more to it – in an environment where even the exact number of speakers is not necessarily known at mix time! I’d say that if you’re primarily worrying about making a mix sound good on the majority of systems it’s going to be played on (which means the majority are going to be systems like iPod earbuds or phone speakers) you’re going to start making the kind of decisions that engineers have been dreading for decades – overcompression and speaker compensation EQ. I think the exact approach depends on exactly what sort of market your mix is going to be used in. 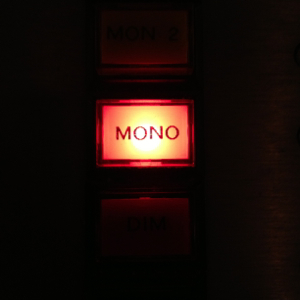 It’s a little shortsighted to say that mono compatibility is ALWAYS an issue in abstract, without necessarily knowing whether what you’re making is a horrible 20 second radio jingle or a 2-hour audiophile’s extravaganza mix. One other point about the merits of working in mono. Geoff Emerick has said that when recording the Beatles they only had a single (mono) monitor speaker in the control room. This caused them to have to work that much harder when tracking to create distinctive sounds. For example, nowadays when you record 2 guitars you tend to pan them out to opposite sides. Then, they had to make a distinctive and unique sound for the 2nd guitar in order for it to easily stand out. yes that’s an excellent point, as true mono is from a single speaker (rather than a phantom centre image from stereo speakers). Also the techniques used to really make mono work highlights the importance and skills in honing arrangements and capturing contrasting sounds well from the outset (read: separation in tone, timing, wet/dry, etc) and not relying on later processing. And these skills also carry over well into creating excellent stereo recordings. Hi Adam, I hope you’re well. Could you please send me a link to the article you wrote on separation of tone, wet/dry etc. I’m having trouble finding it and I’m keen as to read. I lived the info in this mono blog! First, thanks for your comment and apologies for the huge lateness in replying! Secondly, I can’t recall which article that was – it may have been a thread running in the Gearslutz Mastering forum. As an aside there’s this article from The Australian (2011) by Andrew Harris on dynamic range and how “loudness” impacts the listening experience. (I’m honoured to be in esteemed company there with Bob Dylan and Bob Ludwig). Hi all, I’ve got good sounding ‘stereo’ mixes; my sound card has a handy mono button on the master on headphone outs and ‘leads’ almost disappear in mono (there is no ‘cry’ emoji capable of expressing my sorrow!). What Am I Doing Wrong?